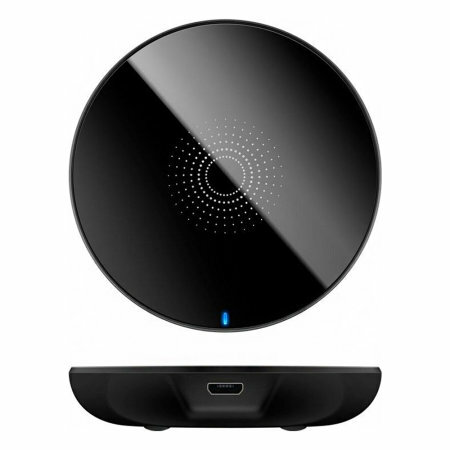 Enjoy the cable-free convenience of wireless charging with this compact, lightweight Qi wireless pad from Goobay. Fully compatible with all the latest smartphones that support QI wireless charging. 1M Micro USB cable included! Good product. Does what it says.One star taken off as it would be better to see the blue light when charging. Device gets hot when charging. This charging pad does exactly what it promised to do. It's small, neat and works very well! Small neat device works well. Only problem is the charging light it is underneath the device, so that it is hard to see. This is a great product. No longer need to plug in your phone, just set it on this device and within a few hours you are ready to go. It does the job, although smaller than I expected which makes it slightly more awkward to get the phone centred for charging. This is only a slight criticism. I was nervous that the charger would not be effective for the low price but on the contrary, the charger works perfectly and it is compact and discreet. I have found with other wireless chargers that you have to place the phone precisely in the right position for it to charge but with this, the 'sweet spot' seems much larger, even though the unit itself is smaller. For such a small product this item works perfect. I didn't realise that the phone & the pad could get hot while charging. Very simple product. The base is very light, to the extent that it is dragged around by the cable doing the charging. So keeping it neat on a desk is a struggle. But it charges my phone no problems. Star deduction for the lightness. I like that its small taking little space, but would be better if it were portable like a charging block or bluetooth. It only works when plugged in. Also can get very hot to the touch when on for long periods. Charges well though, has been helpful since our phones don't use the universal cords where as this auxiliary does allowing multiple device charging. Was cost effective. the item is very small therefor any large phonendoesnt sit comfortably on it . charging power -14% for an all night charge . does go through thin cases, however switched off when phone goes to sleep which defeats the object to leaving your phone to charge. wouldn’t recommend . This is my first wireless charger, easy to use, cheaper that the branded ones, and it works fine. This joker is compact and works great in the car, on trips or around the house. Nothing I needed to know about the charger before I bought it. What can I say, other than, the charger works, and that’s all I needed from it. Useless for playing music whilst charging. The output defeats the input. Also, your device needs to be dead centre on the charger to be effective and stable. Not compatible with my phone. I should have checked to see if my phone was compatatpble. My fault! I could buy a gadget to make it work. This is an incredible device. Who would have thought you could wirelessly charge an iPhone 7. The only issue I have had is that very occasionally, the phone dings as if it has been removed from the charger and then replaced, this can be quite annoying especially if you are asleep. I don’t know if it was a faulty socket that caused it but I have since changed the charger to another socket and so far so good. Would definitely recommend this product. Works with no problem with my Samsung S9+. Tried it leaving the 'phone in its case and the 'phone does heat up a bit in this scenario. Take it out of the case and there is no detectable heat build up either in the 'phone or the charger. As has been noted elsewhere, the unit is small enough to be portable. Great looking small wireless charger, unfortunately that’s where good things end.... When I have placed my phone into correct position so that it charges!! overnight. I wake in the morning only to find that the phone has not charged...! This is happening more and more often.. I go to work and charge my phone on a more reliable wireless charger proving it’s nothing to do with my phone. Will not recommend. Brilliant little piece of kit. On a whim I took a leap and bought 2. Surprised at the actual size when it arrived - very portable. Works off the charger in the car as well so now I'm really kitted out. Impressive so far. Excellent product makes charging easy. Good value. This charger is small enough not to clutter your surroundings. Have no issues in getting any device to charge of the bat. Erratic, Phone has to be positioned exactly or might not charge. I thought it would be more straight forward. It worked straight out of the box. Can’t fault it. works well easy to setup up and use, charges quickly although it does get quite warm. I would like to know if it turns off when the the phone is charged up? Instant set up, fast charge. Does what it says on the tin at a reasonable price. When something looks too good to be true... it generally is! I bought this when it was on sale, after looking at some reviews. In hindsight I should have paid more attention to the reviews saying it was fiddly and unreliable rather than the over-enthusiastic 5-star reviews - I am now in the process of returning it. My experience: Looks good and arrives with a USB to Micro-USB cable to plug into a power source. When trying to charge a Samsung Galaxy S6 it is hit & miss, but mainly the latter. I eventually gave up and plugged the Micro-USB cable directly into the phone, when it does work it charges slowly. The whole point of this type of charger is the ease of use, but every time I had to spend several minutes moving the phone around trying to find the sweet spot where it would charge - this may just be an S6 issue, but that's what I have so it's no good to me. I bought one of these for my desk at work and so far I am very pleased, so much so that I have suggested that my workmates get one. Just make sure that your phone is compatible to save sending it back. The size of the charger is good, tbh i thought it would be a lot bigger but this makes it easier to place anywhere really. I wont keep it at work and will be taking it with me when I travel - this was an afterthought and not something I thought of for this charger, but it is super convenient for travelling too. Charging surface is relatively small. It lasts too long to find the perfect place for charging. My phone always covers the LED indicator of the charger. It is more suitable for an overnight charging than an immediate aid. Postage time frame. I was under the impression it was coming from Auckland but it was actually from the UK. Wasn't a problem but would of saved me bothering you about where it was. Great product, worth the wait. First off if you think your purchasing a complete product with power cord attached, you're not. You get the charging station with no power to run it. You receive the pad and the charging cable. You just need a USB mains adapter. Please contact our Customer Services team so we can assist. The unit is small and compact. It charges the phone overnight without any issues. It is not a fast charger but the price is reasonable.